Will and I just finished watching another Korean drama about food. This one is called Gourmet. It was slow to start, but we got really hooked by the end. It’s about two sons who work at a prestigious Korean restaurant that serves royal Korean cuisine. They’re supposedly descendants of the royal cook, which is a fact that draws in a lot of high-rollers. It has the usual Korean cliches of love triangles (or squares), aging parents, and my favorite, food. 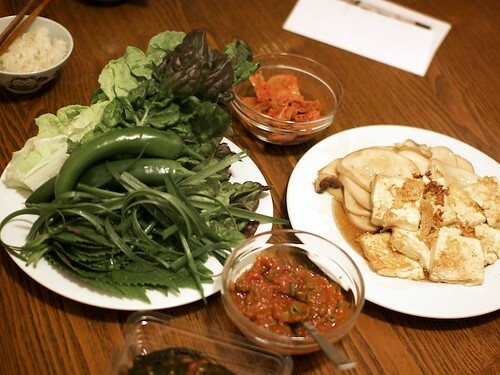 Because we’ve been looking at so much Korean food on-screen, I made two Korean meals last week. The first is ssam, but instead of the usual pork belly, I fried up some tofu and king trumpet mushrooms. The mushrooms actually gave it a satisfying, meaty chew. Then, with the leftover gaenip kimchi, I made bibimbap the next night. 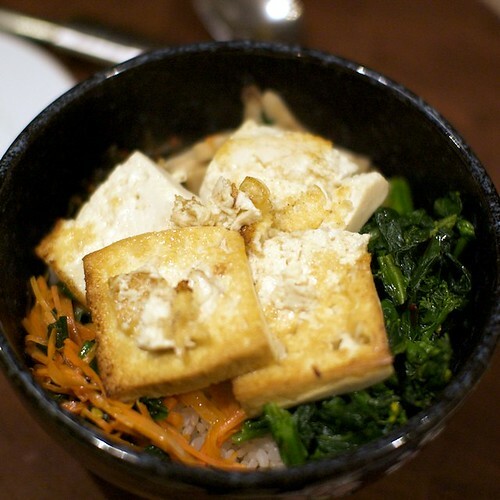 The vegan version has fried tofu (two nights in a row!) while my version had a very delicious fried egg. We’ve been watching a lot of Korean dramas (Boys Over Flowers, My Princess, Coffee Prince) lately and like any good Asian drama, the characters in it are always eating delicious food. This brought on a craving for comforting Korean food so I made doenjang jjigae this past weekend when my parents came over for dinner. Will and my mom preferred the spicier version with gochujang mixed in with the doenjang, but the plain version wasn’t too bad. The soy bean paste stew was easy to make and not fussy at all. 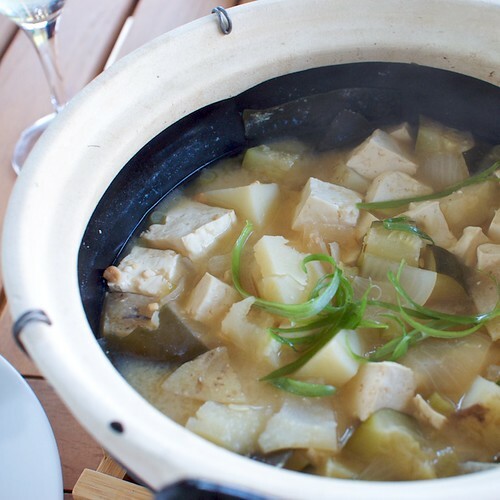 It only required doenjang, onions, zucchini, potatoes, and firm tofu. 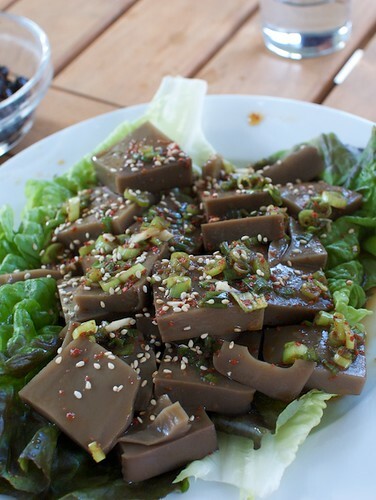 As a side, I also made acorn jelly salad. The dressing was made from Korean pepper flakes, sesame oil, rice vinegar, some brown, sugar, soy sauce, and garlic. The most time consuming part of this meal was slivering the green onions and soaking them in cold water to get them to curl. It makes me wish I had a uni-tasker green onion cutter. But since I don’t sliver green onions that frequently, that seems like a wasteful thing to have. It’s a shame that Pasadena has earned this reputation, but whenever I have to eat at a restaurant in that city, I lower my expectations. Because of this exact reason, I was pleased that Cham Korean Bistro was decent. This casual Korean restaurant located next to Lake is in the same location that another similar restaurant was. I forget the name of the previous restaurant, but I always referred to it as “Korean Chipotle” since it was set up the same way and the food was on the same level. 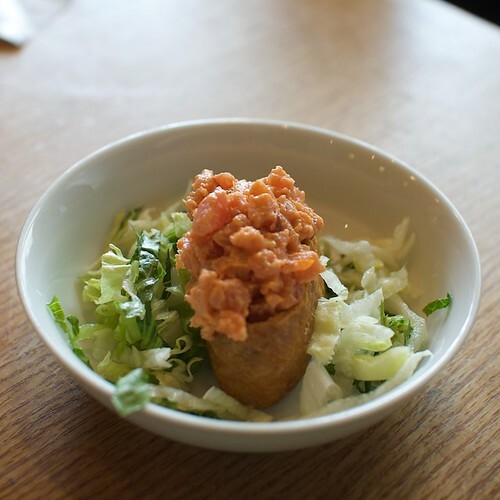 Fortunately, Cham is a little better than “Korean Chipotle.” I started off with a spicy tuna tofu pocket, which was decent as far as spicy tuna goes. The rice wasn’t old-tasting or hard. The spiciness of the chopped tuna had a good kick. The pieces of tuna still resembled tuna and not just some pulpy red mush that some places pass off as spicy tuna. 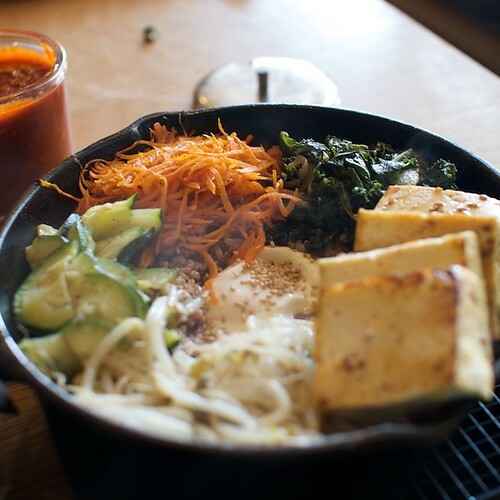 For my main, I ordered the sizzling bimbimbap with tofu and brown rice. Okay, not very genuinely Korean but hey, we’re in Pasadena. I was surprised that this actually came on a sizzling skillet. I had wrongly expected this to be a dumbed down (for liability purposes) version served on ceramic, but no, this baby was indeed sizzling. It even came with its own pot-holder. Taste-wise, it was what I expected of bibimbap: salty, spicy, and slightly sweet. The rice charred up nicely on the bottom. The only thing I was missing was some chopped kim chi. Will ordered dukbokki as his main. I liked that it was nice and red, hot, and even a bit crunchy on the outside where the rice sticks were fried. 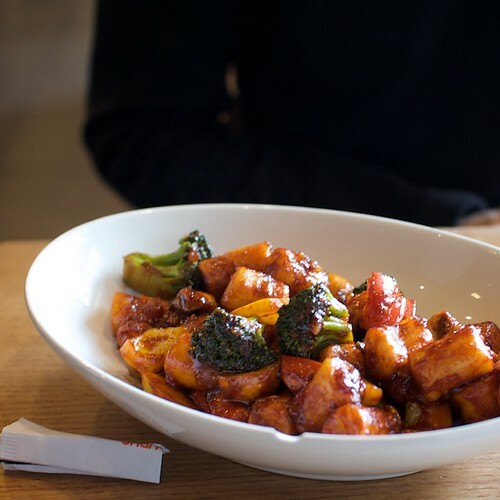 If you’re a fan of crunchy on the outside and chewy on the inside, this is definitely the dish to get. It could be improved with some sort of protein like sliced tofu, but it’s still decent as it is. One reason I don’t go to k-town enough is because Will finds it difficult to find reliable vegetarian food at most of the restaurants I like going to. No, we won’t be ditching k-town for Cham Korean Bistro, but for a casual Korean restaurant in Pasadena, it’s not bad. It also helps to have a decent beer list and be vegetarian friendly.